Personal Training: If you thought that personal trainers were only for celebrities, then I’m positively happy to inform you that nothing could be further from the truth. Sessions are booked in blocks of six one or half hour sessions, spread over six weeks. This starts with a Health Check on week one, and a progress review on week six. Corporate Bookings: Modern life can take its toll on your staff and their energy levels. Frank can work in conjunction with your H.R. department or management, to energise your workforce with planned quick workout routines and talks on positive daily diet and nutrition. Healthy staff our assets. Frank can also arrange presentation days, based on diet, lifestyle, lower back and posture control. 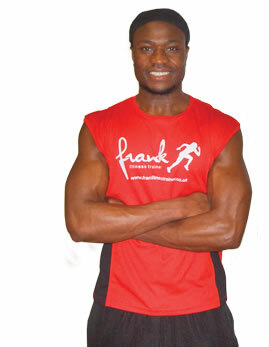 Modelling Photo-shoot bookings: Frank is available for Presentations, Advertising, Modelling, Master Exercise Classes and product endorsement *Frank Fitness does reserve the right to decline work on the grounds of morality or defamation of character to himself or the brand. Charity Requests: Frank Fitness is always keen to give something back to the world, its part of the business philosophy. I have already been involved for good causes such as The British Heart Foundation advertising Cancer Research etc.